The Baofeng series of radios – our recommended best choice for most prepping purposes. The General Mobile Radio Service – or GMRS for short – has evolved since its original establishment in quite different form in the 1960s. In 1987 it evolved to essentially its present form, with business use specifically excluded, with a set of eight channel pairs for repeater operation, and seven single channels for non-repeater ‘simplex’ operation. In 1996 the FCC created a new product – the Family Radio Service or FRS for short. This was sort of ‘GMRS-lite’ and almost literally was squeezed into the ‘gaps’ between GMRS channels. It was designed as a low power service for handheld walkie-talkie type radios only, and unlike GMRS there was no licensing requirement. Anyone could buy FRS radios and ‘play’ with them more or less as they wished. Because the FRS and GMRS frequencies were sometimes the same and sometimes only very slightly different, radio manufacturers started selling dual-purpose radios that could work either as FRS or GMRS radios. In theory, this was illegal, but in practice, it was so widespread that the FCC chose to do nothing. This created a confusing mix of frequencies and channel numbers, and we previously explained the implications of this in our earlier article explaining the confusion of frequencies between FRS and GMRS. Finally – 21 years after this all started to become a mess, the FCC has acted to try and clear things up, publishing new rules and frequencies in September 2017, taking effect from late October 2017. Unfortunately, things are still far from clear, but they are perhaps slightly less messy than before. In particular, there will soon no longer be any more dual purpose radios – something we discuss in our article explaining the changes in FCC regulations about FRS and GMRS radios. Here now is the new improved official list of channels and an explanation of what each channel can be used for. Let’s first look at the most relevant list of channels for many of us – the FRS channels. Note that all FRS channels require a radio with NFM – ie, 12.5 kHz bandwidth. And, as you can see, the numbering of the channels seems somewhat illogical and out of sequence with the order of the frequencies, as does the different power requirement for the 467 MHz frequencies. Note also that the FCC assigns official channel numbers to these channels. Whether new radios will follow the official channel numbering or not is anyone’s guess, but the list, as above, is the ‘gold standard’ FRS frequency/channel list taken directly from the FCC’s own website. The FCC believes it all makes sense, and helps to fit the FRS frequencies more consistently into the GMRS frequencies too. So let’s now look at the GMRS frequencies. In the case of GMRS, not only do we show the frequencies and power, we also show what types of GMRS radio can use each frequency, and explain the frequency pairs for repeater use. On the other hand, there are no official channel numbers. Yes, it is quite a lot messier than the simple table above. As you can sort of see from this table there are several differences between the GMRS and FRS services. Although the FRS channels 8 – 14 are essentially identical with both services, the FRS channels 1 – 7 are restricted to 2 watts whereas the same GMRS channels allow 5 watts, and the channels 15 – 22 can go up to 50 watts with GMRS service but only 2 watts with FRS. Plus FRS radios are limited to small handheld radios with fixed antennas, whereas the GMRS radios can have external antennas and be ‘base’ stations with greater power and/or repeaters. In the power column, we show power of 50/15 for some frequencies. In these cases 50W can be used for mobile, base and repeater radios, but only 15 watts for fixed stations. Note – these definitions are per the FCC Part 95 regulations and seem a bit strange. On the face of it, it seems that handheld units can’t communicate via repeaters, but we suspect this is not actually the case. The key difference between the GMRS and FRS frequencies is there are an added 8 GMRS frequencies that are intended to be used only for repeater inputs (in the 467 MHz range). Otherwise, the frequencies are the same, but power levels are different, and also in the high power channels, GMRS can use wideband FM as well as narrowband FM. Most of these differences are automatically taken care of in the radio sets themselves. The strange mix of frequencies sort of makes sense with this graphic illustration published by the FCC. The new FRS frequencies and power allocations are much better than the original 14 frequencies and 0.5W power limit. This is a good reason to get new FRS radios, and/or to reprogram your Baofeng or other radios to conform to the new frequencies and power limits. It is possible the FCC may now start to lightly enforce some of its rules for the FRS and GMRS bands, so it would be wise to generally comply with the new requirements, now they are in effect. Lastly, and as mentioned in the other article about the 2017 FCC changes to FRS and GMRS, you might prudently choose to get some more Baofeng or similar multi-purpose radios prior to their probable banning, early in 2019. 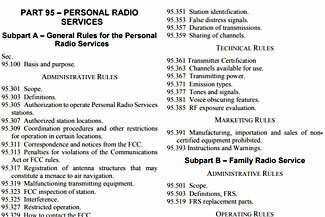 The FCC’s Regulations for FRS and GMRS radio service are contained in Part 95 of their overall regulations. The FCC have changed some of the rules associated with our use of the FRS and GMRS radio bands. This was primarily to resolve the overlap of GMRS and FRS frequencies, and while the ‘solution’ they’ve adopted is a bit clumsy, it also allows FRS radios to have greater power, which is a good thing. There are some implications for preppers in the changes – and while it seems the changes are generally good, you’re probably already old enough to realize that the government is seldom here to help us. So read on, then maybe accelerate some of your Comms preparing. Note that this article, published in November 2017, updates our earlier articles about FRS and GMRS, including an earlier article explaining the formerly confusing mix of frequencies for FRS and GMRS services. You should still read these earlier articles because they contain a lot of general information too, but the specific details of frequencies are now in this new article. Oh – and the formerly confusing mix of frequencies? 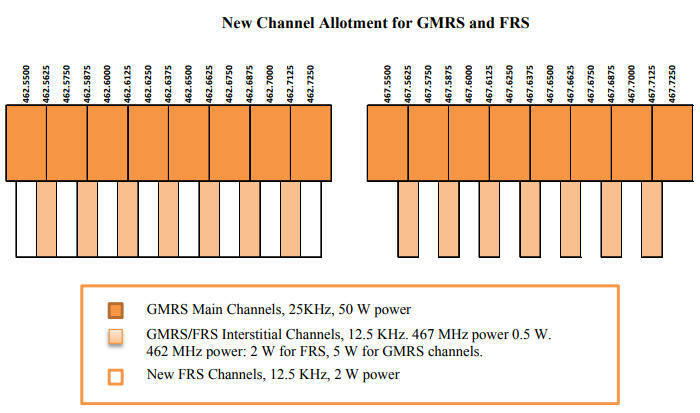 While it is somewhat simplified for FRS, it is at least as complicated for GMRS as before. But it is definitely different, so be sure to check out our new table of updated FRS/GMRS frequencies and their associated power levels and restrictions. The new rules also strengthen the earlier weak prohibition on voice scrambling devices, but there will be an 18 month transition period where it will still be legal to buy or import radios capable of offering this feature, and probably will not be a future prohibition on using them (in these frequency bands – amateurs have not been allowed to use voice scrambling, ever). A disappointing non-change was the widely anticipated removal of licensing requirements for the potentially more powerful GMRS radios. On the positive side, the licensing costs have reduced and the FCC is now going to issue ten-year rather than five-year licenses. In addition, the FCC has formalized the differences between FRS and GMRS radios, and will prohibit the current practice of selling dual purpose FRS and GMRS radios, to make it harder for people to ‘accidentally’ use GMRS frequencies and power levels without a GMRS license. This, and the more powerful FRS radios now permitted, seems to be a solution of general benefit. But there’s a sting in that tail. More significant is the FCC’s ruling that in 18 months, they will ban the import or sale of radios that can be used on the FRS frequencies as well as on other frequencies. We’re not exactly sure what this means, because their explanatory discussion of what they intend seems to be slightly different to the specific wording of the new regulations they have published. For sure, it means that ‘ordinary’ and ‘civilian’ type radios primarily designed for GMRS or for Marine services or for business service can no longer also have FRS frequencies in them. But what about ‘ham’ radios? Typically, ham radios are designed so they can only transmit on officially permitted ham frequencies – this simplifies the design and construction of the radios, so for cost saving reasons as much as anything else, ham radio manufacturers have tended to only sell radios that generally conform to the permitted ham frequencies. But some of the newer radios, using a different type of internal design (software defined radio) can operate on a broad range of frequencies. 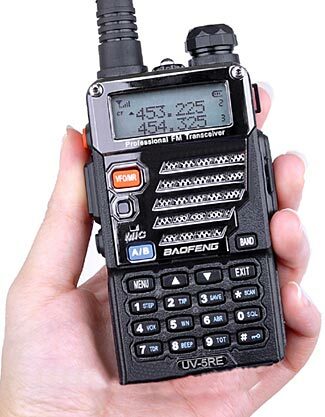 In particular, the Baofeng UV-5R and F8HP family of radios work over a very broad range of frequencies, including ham frequencies, commercial and marine frequencies, government frequencies, and both the FRS and GMRS bands. This gives them a huge amount of versatility, and in a SHTF scenario, means you can communicate with many different groups of people and their radios. Add to that an extraordinarily low price and a good range of accessories, and most preppers include a collection of Baofeng radios in their essential supplies. For this reason, we’ve written in some detail about these radios – you can see articles about Baofeng radios and related topics here. Will the FCC now require that Baofeng radios have a frequency block on the FRS and GMRS bands? While the radios have never been officially approved to operate on those frequencies, until now they have legally been sold including those frequencies, and the radios can generally operate in compliance with the standards imposed on radios working in those two services. Conceivably a prepper might now need to have three radios where previously one was sufficient – an FRS radio, a separate higher powered GMRS radio, and an ‘everything else’ radio (ie the Baofeng). There are two important aspects to this. The first is that you have until early 2019 before it becomes illegal to import or buy multi-purpose radios, and the second is that any radios you already own or acquire within those 18 months remain legal. On the other hand, if it will become illegal, manufacturers will probably discontinue such radios well in advance, so as not to end up with useless stock. So our suggestion is that you might want to think about adding another one or two (or three or four) Baofeng radios to your inventory while they are still available in their open unrestricted form. This means that radios such as the Baofeng multi-purpose radios would no longer be available for sale, although any you already have remain ‘grandfathered’ in as legal. For the last decade or so, the FCC has basically turned a blind eye to activities on the FRS and GMRS bands. The confusion of FRS and GMRS frequencies, combined with radio manufacturers selling combined radios that work on both bands, and at very low retail prices such that anyone and everyone would buy them as ‘toys’ to play with made for a messy situation and the FCC wisely realized there was no way they could prosecute hundreds of thousands of people who bought $25 radios at Wal-Mart and never bothered to read all the fine print about how they could be used and the need to get a FCC license. But now the FCC has acted to clear up the overlap of FRS and GMRS radios, and has also doubled down on its decision to continue to require licenses to operate on GMRS frequencies, we’d not be astonished to note an uptick in FCC enforcement. And that’s not necessarily a trivial laughing matter to ignore. They can – and sometimes do – levy penalties of up to $20,000 per each and every unauthorized broadcast (here’s a particularly severe case where a guy who did some stupid things on police frequencies, nine times, ended up with a $404,166 fine!). This is probably the least of your worries in a TEOTWAWKI situation, but until such unhappy time as it comes about, you probably should be reasonably careful to comply with FCC requirements, especially when involved in transmissions to and from your home or retreat. Your chances of being pulled while operating without a license in your car are minimal, unless you are broadcasting personally identifying information, but if you are at a fixed location, or transmitting to someone else at a fixed location, you’d be surprised at how quickly and accurately your location can be plotted. We as preppers always have to straddle an uneasy divide. We have no wish to break the law, either before or after some major event and societal collapse, because that needlessly draws attention to ourselves, creates a vulnerability, and accelerates still further the decay of the civil society we are all keen to preserve and benefit from. But in a potentially lawless future where there’s no longer any prize for being a ‘nice guy’ and possibly no longer any penalty for being a bad guy, we need to make full use of all appropriate tools possible to optimize our survival. Radios are a case in point. The complex morass of rules created by and enforced by the FCC make sense in normal times, and it behooves us to operation our radio comms in compliance with them. The new changes to the FRS and GMRS services are relevant and important to us. We again recommend you should become a licensed ham operator, as well as having unlicensed FRS radios and possibly licensed (as in simply pay a fee, not sit an exam) GMRS radios too. This article explains the benefits of having a ham license, and the two articles starting from here help you to easily and quickly learn the material and pass the ham license exam. Here is the official FCC ruling on the changes they have made, including (at the end) a complete reprint of the affected sections of their regulations.